A Tony Kane penalty in the 65th minute gave Ballymena United their first league win of the season as they saw off Ballinamallard United 1-0 on Saturday. David Jeffrey’s side will be pleased to have secured the three points away from home while Gavin Dykes Mallards are still looking for their first league points of the season. Ballymena started brightly and forced a couple of corners in the opening minutes but they came to nothing. The Sky Blues had the first half chance of the match in the fifth minute but Neil Lowry dragged his shot wide of the target. Ballymena had another chance in the 16th minute as Leroy Miller tried his luck from the edge of the box - but his shot drifted just wide of the post with Ballinamallard keeper James McGrath scrambling across his goal. Ballinamallard were moving the ball well but it was United who had the next opportunity to take the lead in the 24th minute. Cathair Friel fed Lowry but he put his effort wide of the target. United should have taken the lead in the 36th minute but Lowry shot straight at keeper McGrath when he should have done better. Four minutes after the break Friel had a chance for Ballymena but he pulled his right footed shot past the post. United had the ball in the net in the 58th minute through Lowry but the effort was ruled off-side by the match officials. 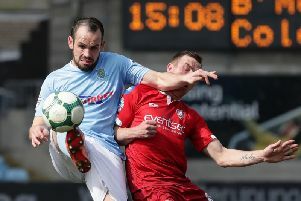 The visitors finally took the lead in the 65th minute from the penalty spot after Friel had been pulled down in the box. Kane strode up and he made no mistake to give his side the lead which they held to the final whistle. Ballinamallard United: McGrath, Morris, Elliott, Taheny, Lafferty, McCartney, McGinty, McCabe, McConnell, Lecky, Armstrong. Subs: McCusker, Feeney, McKenna, Currie, McIlwaine. Ballymena United: Glendinning, T.Kane, Owens, Flynn, Thompson, Jenkins, Friel, Wallace, Lowry, Ervin, Miller. Subs: McCloskey, E,Kane, Shevlin, Blayney, Loughran.